Last Sunday I woke up and realized that two years had passed since my last day of high school. And since I'm a nostalgic person and a chronic overthinker, I couldn't help but feel so strange. It was a kind of feeling that wasn't quite melancholic but still gutted me. There's so much pressure to do big things with your life as soon as high school is over - internships, fellowships, study abroad, etc. While this is more so influenced by social media, so many people dread the inevitable post-grad question "So, what are you up to now?" We're under no obligation to prove anything to anyone, yet a sinking feeling is still present. Of course I'm in a much different place than I thought would be after high school - I was a dreamer back then, and I suppose I still am now but there came a certain point where I had to start being more realistic about my aspirations. Once high school is over, the world can and will swallow you up if you don't know how to navigate it. And while I have learned a lot, I still am learning. Every day. When I was sixteen, I took myself so seriously. I was riding a high I had never experienced before - winning a gold medal for my writing in a nationally acclaimed contest - something that was out of the ordinary for my high school's English department let alone my community and my family. And once all the hype finally died down, I couldn't help but feel like I had to keep doing more and entering more contests even though the odds of winning anything that significant again were statistically stacked against me. I thought that I wasn't special anymore - this was stemmed from the toxic narcissism that I was surrounded with at home growing up. Because I took myself so seriously, people thought I was pretentious, but I didn't mean to come off that way. Whenever people bring up the award now, an uncomfortable, bashful smile appears on my face and I try to brush it off - I don't want my biggest accomplishment in my life to be something that happened to me when I was sixteen. I don't want to be like that guy who sits at the bar talking about how he was the quarterback in high school. I fondly acknowledge the things I did in high school with my writing as part of my past. That award did raise my ego but as time went on it simultaneously crushed it - it gave me high expectations for where I would be career-wise after high school, when I began college - and when I realized that those expectations were far from my reach, I was heartbroken and frustrated. 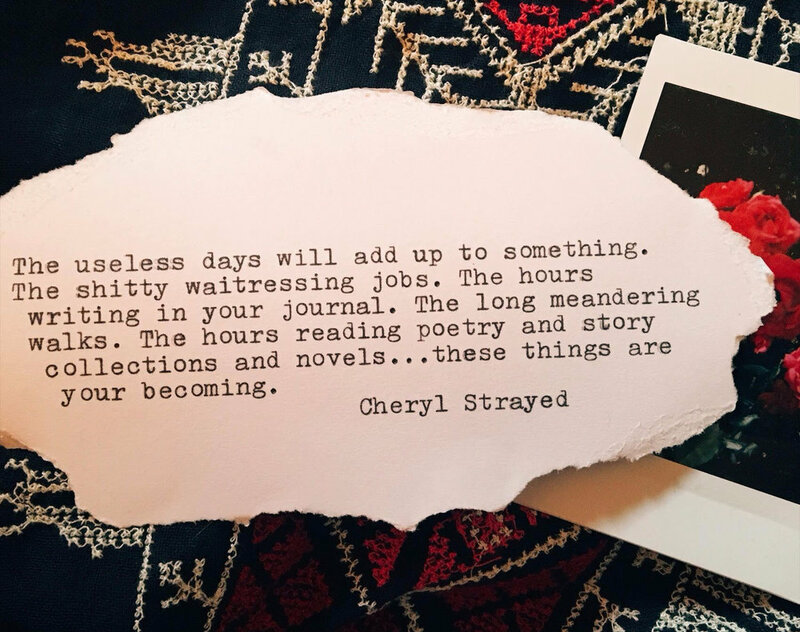 But as Cheryl Strayed once said (I have mentioned her quite a bit on this blog; her writing has been essential to my growth since high school) - self-pity is a dead end road. Great things don't happen to you right away. You have to work your way to where you want to be. And now at age twenty I've been teaching myself to be more patient, and focus more on what I'm doing in the present. I suppose it's safe to say that I've been in an in-between place in my life for a while now. Among college students there is the phrase "sophomore slump" - alluding to the increasing difficulty of college life emotionally and academically after freshman year. The course load is heavier, the expectations are higher, and as a result the feelings associated with college change drastically compared to the enthusiasm that was ever-present freshman year. In the grand scheme of things, college (and life after high school) ultimately boils down to just dealing with it. It doesn't matter how you feel - you just have to keep going. Speaking from personal experience the sophomore slump is real - granted my second year of college was worlds away from my first one, but the thought did cross my mind - This just isn't exciting anymore. Don't get me wrong, I love being a student, but sometimes you do the work not because you love it, but because you have to. While I'm a strong believer in making the most out of any situation I'm placed in - for a while I've felt like my life hasn't really began since high school ended. I was placed in situations that ended up not being the best for me emotionally and financially. But all you can do when the unexpected happens is to learn from it and keep going, and I know now that the challenges and changes I've faced in the past year and since high school ended have been worth all the exhaustion because in a couple of months, things are going to turn around for me. And I've worked really hard to get myself here, and to where I'll be in the future. The beauty of it is that no one can take that work away from me or invalidate it - because it's been living and breathing inside of me for so long. The point that I'm trying to get across here is that you shouldn't beat yourself up for not living up to an idea you once had of yourself. Don't beat yourself up for where you are in your life after high school, because like I said before, you're under no obligation to prove anything to anyone. You should be making yourself happy. It's okay that you don't have an internship yet, it's okay that you work somewhere that isn't related to your major or preferred career, it's okay to feel stuck - it takes time. Everything you do now does add up to something. It's only a matter of whether or not you're willing to wait.